Sukelküttekehad There are 20 products. Dražice screw-mounted electrical heating unit is designed exclusively for water heating. 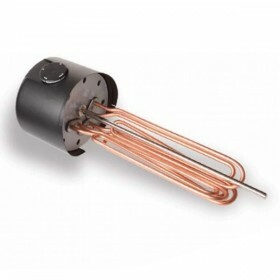 Heating unit is designed as an additional heating source in water heaters connected in a system with solar collectors. Heating unit can also be used as an additional source of heating in accumulation tanks. If the installation requirements are obeyed, it can be used as the main source of heating by a heater, or for other purposes. 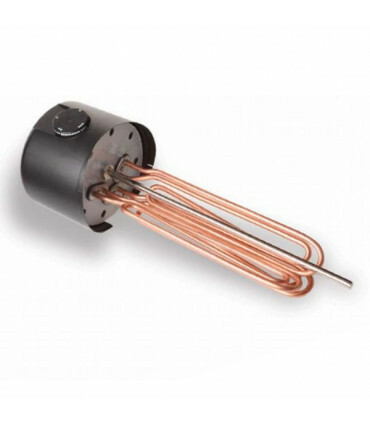 The heating unit consists of an electrical heating element with a connecting thread G 1½" (6/4"). A thermostat and a safety fuse; the element's operation control light; and a connecting terminal board are placed under the wiring plastic cover. To use the OKC…NTR, NTRR, OKCE…NTR, NTRR heaters in solar systems with reheat by means of electricity, the heaters have a G 6/4" neck placed for mounting a secondary electrical heating unit. The heating unit is placed above the lower exchanger. The product is designed for permanent contact with drinkable water. Heating unit used for electric heating of hot utility water designed for fitting into the flanged manhole of OKC NTR (OKCE) x/1MPa heaters. The heating unit is equipped with heating elements and operating and safety thermostat with the temperature range of hot utility water 0–77 °C. The REU, RDU, RDW and RSW types with fixed output 2,5–15 kW. The SE 377 type with variable output within the range 8–11–16 kW and SE 378 with variable output within the range 9.5–14–19 kW. Threaded electric heating unit TJ G, 2,5 kW, 1 1/2" Dražice. Electric heating unit lenght L1 405 mm . Threaded electric heating unit TJ G, 6 kW, 1 1/2" Dražice. Electric heating unit L1 520 mm. Built-in electric flange heating unit, output 2,5 kW. 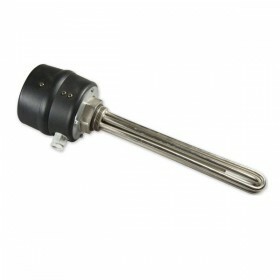 Heating element lenght: 450 mm. BY ORDER, 2-3 weeks.